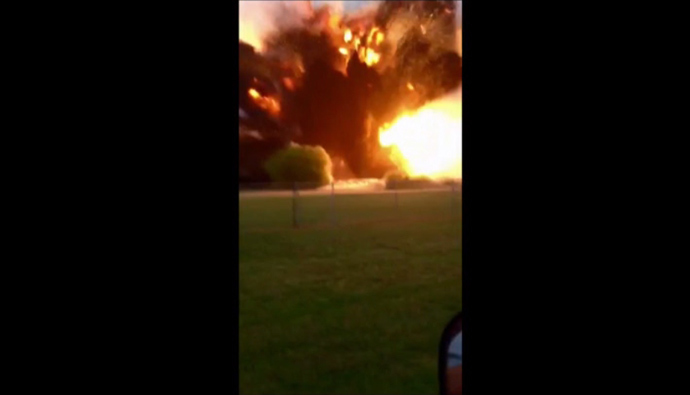 April 18, 2013 A massive explosion has rocked a fertilizer plant near Waco, Texas. Hundreds of people were likely injured, state official says. A nursery home was destroyed by the blast and numerous buildings were damaged. 06:35 GMT: 172 people confirmed hospitalized, 24 people in critical condition, 38-40 people in serious condition and 23 more people en route to be admitted to local hospitals, ABC News reported. 05:25 GMT: “Probably over 100 injuries,” while the number of fatalities remains unknown, says DPS' DL Wilson. 04:43 GMT: HazMat squads have been deployed in the area to analyze the environment forpossible toxins. 04:34 GMT: People are coordinating the relief effort over Twitter, compiling a list of those willing toprovide housing to those who lost their homes in the explosion. There are also calls to donate blood to local hospitals.